If you have information to contribute about Kenosha County Family Businesses, you may submit the information here. Please help others with their research by contributing to this page. You may E-mail them to us. Thanks. This business was established in 1895 by F. B. Macomber and George S. Whyte, who are still at the head of the undertaking. The company manufactures wire rope and wire and their goods are recognized as the standard of the country. They also patented a non-rotating rope, called Kalindo, and other specialties of their manufacture include the Monarch rope, made from wire with tensile strength of 280,000 pounds per square inch. This rope is made from a quarter inch in diameter to three inches. In 1912 the plant was removed from Coal City, Illinois, to Kenosha, where it now covers ten acres and includes concrete, brick and steel constructed buildings. They employ over two hundred men, twenty-five percent of whom are skilled laborers. The main office was removed from Chicago to Kenosha in September, 1915. The product is sold for hoisting purposes, being used in connection with coal mines, dredges, derricks, passenger and freight elevators, etc. They also handle derrick guy ropes. Their output is sold all over the United States and branch offices are maintained in Chicago, Pittsburgh, Portland, Seattle, Washington, and Havana, Cuba. In 1915 their manufactured product included over fifteen million feet of wire rope. Kenosha has had many newspapers throughout the years. This is an early history that was published even before Kenosha's current newspaper "The Kenosha News" was started. This business was established in December, 1893, and incorporated in 1909. The present officers are: Frank L. Wells, president and treasurer, Walter Wells, vice president; and Earl Wells, secretary. The company manufactures wire-working machinery and machinery for the building of brass and iron beds. From sixty to seventy people are employed. They own their own die-making, pattern-making and casting-making machinery. The plant covers 23,000 square feet and is thoroughly modern in every particular. Allen Tannery, N. R. Allen & Co.
Allen's Tannery -- Nearly a quarter of a century ago, viz., in 1856, the first tannery in Kenosha County was established on the bank of Pike Creek, by Mr. N. R. Allen, in a frame building. with a capacity of about 5,000 pieces per year. The total cost of the place not exceeding $3,000. As the business increased and trade improved, he enlarged the building and its capacity, until, in 1866, he had increased it to 20,000 pieces per year. In that year, it burned down, involving a loss of $15,000 ; but, during the same season, he rebuilt, and since then has increased it in size and capacity, until the present year, at a total cost of $300,000. In 1869, Charles Allen was admitted as a partner in the firm, and last year, N. R. Allen, Jr., experienced the same apprenticeship. The present firm is N. R. Allen & Co., who, in the performance of their work, employ eighty men, and liquidate a weekly pay-roll of $700. The capital invested is stated at $125,000; and the firm do an annual business aggregating $250,000 or thereabouts. The N. R. Allen's Sons Company, now operating the largest individual tanning industry- in the world, is one of the foremost of the industries in Kenosha. This business had its inception in 1856, when Nathan R, Allen and his partner, Levi Grant, opened a small tannery. The start of the present large establishment was made by N. R. Allen and Mr. Smith, Mr. Grant retiring from the firm at that time. Mr. Smith, upon entering into partnership with Mr. Allen in the tannery, established at Rockford, Illinois, as a part of the business of the firm, a factory and salesroom for the manufacture and sale of farm and buggy harness, using a greater part of the leather tanned in Kenosha. After continuing with Mr. Allen for several years Mr. Smith proposed to divide the partnership of Allen & Smith, the latter taking the harness factory at Rockford, which was at that time the more profitable end of the business, and Mr. Allen retaining the tannery at Kenosha. His plant consisted of a small frame building on the east bank of Pike Creek, a few rods south of the present Grand Avenue bridge. Mr. Allen was not a practical tanner. He was an excellent business man of the old school. His eldest son, Charles W. Allen, when a young man had entered the business as a beam hand, starting in at the first process of preparing the hides for the vats. He later became a journeyman. After a long service in the shops he was taken into the business as a partner in 1869 and the firm became N. R. Allen & Son. About ten years later N. R. Allen, Jr., was admitted as a partner, at which time the firm style of N. R. Allen & Sons was assumed, the relationship thus continuing until the death of N. R. Allen, Sr., on April 20, 1890. At that time Charles W. Allen and N. R. Allen, Jr., formed a partnership under the firm name of N. R. Allen's Sons and purchased from the other heirs their interest in the estate of their father in the tanning business. From April 20, 1890 until August 1, 1905 under the firm name of N. R. Allen's Sons, the business was carried on with renewed vigor and upon larger lines. On February 2, 1890 the plant was almost totally destroyed by fire, the power house and one other small building alone remaining. Adjoining the tannery on the east stood the old Pennoyer Sanitarium which, with the exception of one small cottage, was burned to the ground. Shortly before the death of N. R. Allen, Sr., the Pennoyer property was sold to the Allens and from a small beginning, with less than an acre of ground space, the development has continued until today the plant covers about eleven and a half acres, while the various buildings are from three to five stories in height. There are twenty-eight buildings in all, and with one exception, all of mill construction, with the sprinkler system of fire protection throughout. The machinery is operated by electric power which is manufactured by a steam plant of twenty boilers, developing 5,000 horse power. They employ upon an average of 1,000 men and utilize domestic packer hides, making heavy sole leather, harness and saddlery leather. They have an entire tannery devoted to the making of sole leather strips, used mostly for repair work. They operate a hide department which purchases annually over one million hides. The present officers of the company are: Edward C. Thiers, president, A. H. Moore, vice president and general manager; M. B. Ketcham, secretary and treasurer; E, H. Amory, superintendent; and Thomas Donley, vice president and hide buyer. Kenosha, has reason to be proud of many of its industrial and manufacturing enterprises, prominent among which is that conducted by the N. R. Allen's Sons Company, operating the largest individual tanning industry in the world. The tanning business had its inception in 1856, when F. W. Lyman, under the firm name of Freeman & Porter, opened a small tannery on Jerome Creek, just south of the present site of Kemper Hall. This tannery was destroyed by fire. Nathan R. Allen and Levi Grant afterward opened a tannery in the north part of town. The start of the present large establishment was made by Nathan R. Allen and William H. Smith, Mr. Grant retiring from the firm at that time. William H. Smith, upon entering into partnership with Mr. Allen in the tannery, established at Rockford, Illinois, as a part of the business of the firm, a factory and salesroom for the manufacture and sale of farm and buggy harness, using the greater part of the leather tanned in Kenosha. After continuing with Mr. Allen for several years, Mr. Smith proposed to dissolve the partnership of Allen & Smith, the latter taking the harness factory at Rockford, which was at that time the more profitable end of the business, and NMr Allen retaining the tannery at Kenosha. His plant consisted of a small frame building on the east bank of Pike Creek, a few rods south of the present Grand Avenue bridge. Nathan R. Allen was not a practical tanner. He was an excellent business man of the old school, honest to a fault, always willing to give value received and of the type of business men "whose word is as good as their bond." His eldest son, Charles W Allen, when a young man had entered the business, as a beam hand, starting in at the first process of preparing the hides for the vats and working his way through the tanyard and harness currying shops until he became a journeyman. After a long service as a workman in his father's shops, Charles W. Allen was taken into the business as a partner in 1869, and the firm became N. R. Allen & Son. About ten years later N. R. Allen, Jr., was admitted as a partner, at which time the firm style of N. R. Allen & Sons was assumed, the relationship being thus continued until it was dissolved April 20, 1890, by the death of Nathan R. Allen, Sr.
At that time Charles W. Allen and N. R. Allen, Jr. formed a partnership under the firm name of N. R. Allen's Sons and purchased from the other heirs their interest in the estate of their father in the tanning business. From April 20, 1890 until August 1, 1905, under the firm name of N. R. Allen's Sons, the business was carried on with renewed vigor and upon larger lines. On the 2d of February 1890, the plant was almost entirely destroyed by fire, the power house and one other small building alone remaining. Adjoining the tannery on the east stood the old Pennoyer Sanitarium, which with the exception of one small cottage was also burned to the ground. Shortly before the death of N. R. Allen, Sr., the Pennoyer property was sold to the Messrs. Allen, and from a small beginning, with less than an acre of ground space, the development has continued until the plant today covers about eleven and one-half acres, with a floor space, including vat area, of 675,000 square feet, while the various buildings are from three to 5 stories in height. There are twenty-eight buildings in all, and with one exception all are of mill construction, while throughout the sprinkler system has been established. The machinery is operated by electric power which is manufactured by a steam plant of twenty boilers, developing five thousand horsepower. They employ on an average of onr thousand men and utilize domestic packer hides, making heavy sole leather and harness and saddlery leather. They have an entire tannery devoted to making sole leather strips, used mostly for repair work. They operate a hide department which purchases annually over a million hides. Their manufacturing department is actuated by the fixed purpose of always producing the best sole leather strip, while their selling department gives its entire time, attention and service to the wants of customers, actuated by a policy of fair and equitable treatment to all. The company maintains a uniformity of stock due to standard and unvarying selections to which strips must conform to be placed in the grade indicated by the label. The excellence of the manufactured product makes their output a standard of comparison. They sell to the jobbers and large manufacturers, and the plant has a capacity of four thousand sides of leather per day, or twenty-five million pounds of finished leather per year. The present officers of the company are Edward C. Thiers, President; A. H. Moore, Vice President and General Manager; M. B. Ketcham, Secretary and Treasurer; E. H. Amory, Superintendent; and Thomas Donley, Vice President and hide buyer. These men are all well trained through long experience for the duties which devolve upon them, and their force and resourcefulness are indicated in the fact that the business maintains its place as the leader in its line among all the establishments of the world. The Whitaker Engine and Skein Company was organized in 1875, and duly incorporated August 30, 1876, with a capital stock of $40,000, and possession taken of the old gravel foundry on the northeast corner of Exchange street, built by Forward & Shuard, which was removed and an enlarged brick foundry erected in its place. It should be stated that the foundry property was purchased by R. B. Whitaker & Co. in 1865 and thoroughly repaired. Since that date, the manufacture of thimble skeins and engines and boilers has been the main business of the company, but the usual business of a machine shop has also been carried on. During this period, a large number of engines and boilers have been manufactured under the superintendence of R. B. Whitaker, which have earned and held a good reputation as working machines. In 1868, a fifteen-horse power engine and boiler was made for Edward Bain, but, in the course of two years, was found to be too small for his rapidly-expanding business. In 1870, it was replaced by a fifty-horse power engine. This last has done excellent service for over eight years, and has done probably as much work as any of its capacity in the State. It will, however, soon be replaced by an engine and boiler of 125-horse power, which is now being made by the company. Between thirty and forty men are employed, the number varying according to the demand of the times. About nine hundred tons of iron are used per annum, daily heats being over three tons. The main branches of the Company's business are the manufacture of skeins (of which they make twenty-four sizes), engines and boilers, fanning-mill irons, tire-benders. tire-drills, shaper machines, seeder-castings, reach and bolster plates, and cauldron kettles. Annual sales range from $45,000 to $55,000. The company are now making furnaces and a large trip-hammer for the purpose of manufacturing wagon-skeins out of steel plates, to be used on wagons made for the rough, rocky roads of the mountainous districts of Utah, Colorado, and other parts of the Far West. The figures in regard to the small work are about as follows : Fifty sets (four in a set) of skeins and nuts) daily, which are first cast, then tumbled or rattled, centered, turned for the nuts, screws cut, nuts and boxes put on and faced. The skeins are then ready for shipping. The nuts are drilled and tapped. About two thousand sets are made for fanning-mills a year. They have in working order ten lathes, two planers, six drills, and a large milling-machine. The large lathe used for turning wheels and other heavy work is one of the largest in the State, having six feet eight inches swing. Then there are two No. 6 Sturtevant blowers. They have most beautifut engine in the city in their engine-room of forty-horse power. The present officers are : F. Robinson, President; George Yule, Vice President; John Nicoll, Secretary and Treasurer; R. B. Whitaker, Superintendent ; F. Robinson, John Nicoll, R. B. Whitaker, Edward Bain, Z. G. Simmons and George Yule, Directors. Gottfredsen's Brewery -- In the year 1855, Mr. J. G. Gottfredsen established his brewery on the present site, with the then small capacity of eight barrels per day. The building was of brick, and cost $1,000. In 1860, he improved the premises and enlarged its capacity to 1,000 barrels per year, but in 1877, the building was destroyed by fire. He, however, immediately rebuilt, investing fully $12.000, and, at the same time, admitted his son as a partner. The present capacity is 1,500 barrels per year. The firm is at present known as J. G. Gottfredsen & Son, giving employment to about seven men, and have invested not less than $18,000. Muntzenberger's Brewery -- As early as 1849, Mr. A. Muntzenberger, recognizing the fact that beer was to be king, established a small brewery on the site of his present large establishment, with a capacity of five barrels per day. The building was of frame, and cost $500. In 1864, finding that his trade had largely increased, he pulled down the old place and rebuilt, expending in the operation about $20,000, and increasing the capacity to sixty-five barrels per day. About four years ago, Mr. Muntzenberger sold out to his son, Mr. A. Muntzenberger, and a Mr. Engle, who controlled it until last May, when the former bought the latter out. Mr. Muntzenberger, the present sole owner, employs a force of twelve men during the summer, when his commodity is largely in demand, reducing, the same to six during the winter months. He does his own "malting," and his establishment is arranged for that purpose with due regard to expedition in large quantities. This immense manufactory, of which the people of Kenosha are justly proud, was established in 1852 by Mr. Bain. The principal business was at first repairing, although new wagons were occasionally made. As the city of Kenosha increased in magnitude, and the facilities for shipping goods became greater, the business of Mr. Bain materially increased, until, in 1865, was building twenty wagons per week, or about 1,500 per year. From a repairing business this was quite a jump, but as the fame of his wagons increased, so did his business, and accordingly, in 1868, it had attained to 2,500 per year. From that time to the present, it has grown until it has reached the enormous manufacture and sale of 10,000 wagons per annum, which is the number that will be placed on the market the current year, from the sale of which will be derived the enormous sum of $650,000. As showing the magnitude of the business, it may be stated that in the manufacture of wagons the firm uses one hundred tons of iron per month, and indefinite quantities of well seasoned pine and oak, there being at the present time nearly 2,000,000 feet of lumber stored, awaiting demand. The capital invested is estimated at $700,000, the number of hands employed over 300, and the weekly pay-roll $3,200. The firm does an immense export trade, furnishing wagons to Utah, Nebraska, Colorado, New Mexico and to Europe, and the work furnished is said to give perfect satisfaction. From the following figures it will be seen in what proportion the business has increased: In 1870, there were sold and shipped 3,820 wagons; in 1871, 4,075; in 1872, 5,013; in 1873, 5,274; in 1874, 4,921; in 1875, 5,450; in 1876, 7,009; in 1877, upward of 8,000; in 1878, 9,704, and for the present year, the number is estimated at upward of 10,000. The works occupy an area of territory comprehended in full four blocks, upon which are built shops, painting-houses, seasoning buildings, drying-houses, etc., almost without number, presenting the appearance of a village, and, as stated, furnishes employment to 300 mechanics, artificers, journeymen and apprentices. The Kenosha Fanning-Mill Company was organized in the fall of 1870, for the purpose of manufacturing an improved fanning-mill, by Z. G. Simmons, J. H. Howe, H. T. Lesley and G. E. Clark. After operating a short time, Messrs. Simmons & Howe purchased the interest of Lesley & Clark, and continued the business until the fall of 1871. At that date, a new firm was established, which has existed to the present date, and is actively engaged in the business of Manufacturing the "Pacific Fanning-Mill, " which has a national reputation, having been sold from Maine to Oregon. The present firm is composed of Z. G. Simmons, J. H. Howe, J. H. Carleton and I. H. Bradford, and the annual sales vary from $60,000 to $75,000. The First National Bank succeeded the City Bank, of Kenosha, of which S. Bronson, Jr., was President, and H. W. James, Cashier. The First National was organized in January 1864, and authorized to commence business at once, with a capital of $50,000. The first President was Thomas Pricture; Cashier, E. G. Durant. The present officers are: Z. G. Simmons, President; U. Newman, Vice President; L. G. Merrill, Cashier, and A. H. Tyler, Assistant Cashier. Board of Directors-Z. G. Simmons, J. H. Howe, U. Newman, F.. Robinson and E. Bain. The First National Bank of Kenosha had its beginning in 1852 under the name of the State Bank of Kenosha and was capitalized for $100,000. At that time Henry B. Towslee became president, with Edward G. Durant as cashier, and they together with Samuel Hale, H. W. Hubbard, Seth Doan, A. Campbell, John V. Ayer, H. B. Towslee and C. G. Davidson, constituted the Board of Directors. This institution was nationalized on January 2, 1864, its number being 212. This number has been renewed with various renewals of the charter. When the bank was nationalized its capital was $50,000. The bank has had among its directors the following well known, prominent and honored business men: Z. G. Simmons, Edward Bain, Seth Doan, George Yule, Frederick Robinson, L. G. Merrill, James H. Howe, Urial Newman, Thomas B. Jeffery and many others, all of whom are now deceased, with the exception of George Yule. The bank entered upon a period of prosperous existence and in due time the capital stock was increased to $100,000 and is now $150,000, while there is a surplus fund of equal amount and its total deposits amount to $325,000,000. The first president was succeeded by Thomas Pricture, he in turn by B. F. Aldrich and then came Z. G. Simmons, who remained in the presidency for thirty eight years. In 1912 Charles C. Brown became president and so continues. The first cashier was E. G. Durant and he was succeeded by John H. Vermilye who came to Wisconsin from New York. The succeeding two incumbents to that position were L. G. Merrill and Gilbert M. Simmons. The latter died January 15, 1890, at which time Charles C. Brown became cashier and when the last named was elected to the presidency William H. Purnell became cashier. Mr. Brown, however, had served three years as vice president before assuming the presidency. The bank removed into its present building in 1885. The structure is 50 by 100 feet and is thoroughly modern in its equipment. This is one of the largest banks in the state, having twenty-four employees. The Northwestern Loan & Trust Company was organized by the directors of this bank and	and was the third organized in Wisconsin. It is the only trust company in Kenosha and one of the twelve in the state at the present time. Its officers are: C. C. Brown, president and treasurer; George Yule, vice president; W. H. Purnell, secretary; and W. C. Crosby, assistant secretary. The Kenosha Gas Works were incorporated in 1872, by Larkins & Collins, of Milwaukee, with the design of forming a stock company and furnishing "gas-light and coke" to consumers at price. Bonds were issued and offered for sale, Larkins & Collins receiving their pay for building and putting the works in order in bonds. The venture, however, did not prove the success that was anticipated, and, in 1875, the works were sold under foreclosure proceedings and the company re-organized, with U. P. Smith, of Chicago, President. At the same time, Pittsburgh coal was substituted, for naphtha, from which, up to that time, the gas had been manufactured. The works have a capacity of manufacturing 14,000 cubic feet daily, and are regarded as promising abundant returns in the future. There are now about one hundred consumers in the city and forty-five street-lamps; none of the latter, however, are in use. The present officers are: J. H. Kimball, President; U. P. Smith and William D. Kimball, Directors. The Capital is stated at $50,000. Kenosha Malt House, an institution owned by M. H. Pettit & Co., was organized in 1857 by the above firm. Wen first built, its capacity was but 50,000 bushels, but that speedily proved to be too small; so, in 1866, it was town down and rebuilt in its present form. It is a brick, four stories high, with a capacity of 300,000 bushels, and cost $50,000. the barley for malting purposes is obtained from Toronto, Canada, and California. The firm furnish employment to twenty men and the capital invested is from $150,000 to $200,000. Mr. Pettit, ex-Lieutenant Governor of the State, having died in March, 1873, the present firm consists of his widow and J. C. M. Kehlor, with J. M. Pettit, business manager. The establishment controls an extensive trade with New York, Milwaukee, cities in Colorado, Louisiana and elsewhere, and contributes materially to the prosperity of Kenosha. Dan Head & Co.'s private bank was organized under the laws of the State of Wisconsin in May, 1875, with a capital stock of $75,000, $50,000 of which was paid up. The stockholders were: Dan Head, Edward Bain, Urban J. Lewis, Dan Knapp, E. G. Hazelton, F. G. Head, J. C. M. Kehlor, J. R. Marsh, L. Fellows, G. L. Tracey, R. E. Sutherland, L. B. Nichols, George Hale and George C. Lawrence. Directors - Dan Head, George D. Head, Edward Bain, L. B. Nichols, R. E. Sutberland, E. G. Hazelton and Urban J. Lewis. The officers th elected were: Dan Head, President; Urban J. Lewis, Cashier. The business is that of a general exchange bank, and, though not on the same footing as the national banks, is obliged to keep its reserve fund up to the national standard. The annual election is held in January, and, at the last election, the officers and Board of Directors were the same as when the bank was organized. One of the substantial business enterprises of Kenosha is that operating under the name of the Hannahs Manufacturing Company which corporation in 1892 succeeded the business of the Kenosha Company, of which the owners were F. C. Hannahs and J. A. Jackson. The business was established in 1884, the firm engaging in the manufacture of children's cribs. As time passed on the business was broadened in its scope to include the manufacture of library and parlor tables, and the extension of the trade made its business known in all arts of the civilized world, its sales being particularly large in Cuba, Porto Rico[sic], Mexico, South America and Australia as well as in the United States. Facilities were increased to meet the growing demand of the trade until the company was utilizing a floor space of more than 150,000 square feet and employment was given to 250 workmen, the institution becoming one of marked industrial and commercial prestige in Kenosha. Today the plant covers three acres and occupies a two-story building splendidly equipped for the manufacture of the goods which constitute the output. The company uses steam power to generate electric power for the plant, have a sprinkler system and mill construction. In 1914 they discontinued the manufacture of children's cribs and children's furniture and have since concentrated their efforts upon parlor, library and bedroom tables which they sell to the jobbing trade all over the United States. They manufacture 300 library tables each day and 500 small tables, using hard wood altogether. The officers of the company are: F. C. Hannahs, president; A. B. McCall, secretary; and L. T. Hannahs, treasurer. The business of the Frost Manufacturing Company was incorporated in 1902, with C. N. Frost as the president and Walter J. Frost as the secretary and treasurer. 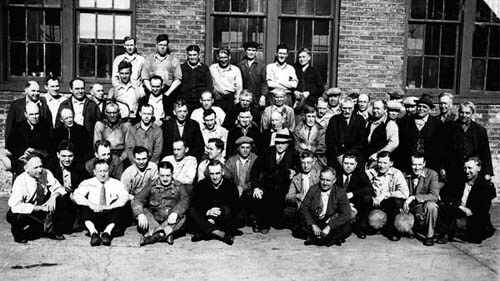 They took over the plant of the old Badger Brass Manufacturing Company, which was situated at Elizabeth and Pleasant streets, and there the continued in business for ten years, when they sold the plant to the American Brass Company, erecting a new plant for their own use at Fremont Avenue and Strong Street. Today they have a floor space of 50,000 square feet and employ 150 people. They manufacture plumbing supplies and sell to the jobbing and manufacturing trade. The American Brass Company has one of its leading branches in Kenosha and the business conducted here constitutes one of the important industries of the city. Its plant covers an entire block the buildhing is largely a one-story structure of steel, supplied with a sprinkler system and other equipment which safeguards the interests of the employees as well as of their concern. For a number of the business was conducted under the name of the Chicago Brass Company, which in 1912 sold out to the American Brass Comapny, since which time the Kenosha enterprise has been known as the Kenosha Branch of the American Brass Company. Under the corporation organization it is affiliated with the Ansonia Brass & Copper Works of Ansonia, Connecticut, the Benedict & Burnham branch at Waterbury, Connecticut, the Coe Brass Works at Torrington, Connecticut, the Coe Brass branch at Ansonia, Connecticut, and the Waterbury Brass branch at Waterbury. The Kenosha branch manufactures brass sheets, rods, tubes and bars. They sell to manufacturers and the output is sent all over the United States. They use all raw material, converting it into the finished product according to the most modern methods and processes. They employ 1,800 people, 20 percent being skilled labor. A night school is maintained for the employees. The officers of the Kenosha branch of the American Brass Company are:, George H. Allen, vice president; C. J. Hackett, manager; A. H. Quigley and J. R. Anderson, assistant managers; W. D. Martin, purchasing agent and traffic manager; and C. S. Judd, superintendent. The Hill Steamboat Line, operating, between Chicago and Port Washington, is a Kenosha corporation, which was organized in 1903, the L. P. Hill as president; L. L. Hill, vice president and general manager; and E.V.M. Hill, secretary. Upon the death of L. P. Hill in 1915 W. W. Hill succeeded to the presidency, while W. S. Hill is now vice president and L. L. Hill is secretary and general manager. This company operates two boats, the Maywood of 400 tons and City of Marquette of 340 tons. They make the run between Chicago and Port Washington, touching at all intermediate points, including Waukegan,	Kenosha, Racine and	Milwaukee. They make daily trips and carry only freight. The company employs sixty-five people and they have docks in Chicago, Racine and Milwaukee in connection with the C. R. & M. line, while in Port Washington they own a dock independently and in Waukegan and Kenosha they, use rented docks. Their business has become all important factor in marine transportion and is capably managed and liberally patronized. This mill was intended to be the master achievement of Gideon Truesdell. Great pains were taken to embody in it all the best modern improvements, and no pains or expense were spared to make it a perfect mill of its kind. It has three run of stone and is capable of grinding from 300 to 400 bush. per day, or from 65,000 to 75,000 bushels per annum. It cost about $27,000, and is now owned by Rouse & Z.G. Simmons, who have made still further improvements in its running department, and a marked improvement in the quality of the flour. The fact that there is a rapid and increasing market for the Kenosha flour in this county speaks well for its future success. The establishment of Leonard Lee & Son., though burned down several years ago, was immediately re-built. Mr. Lee & Son, have now invested in the business about $12,000 which is principally devoted to the making of tow for the western market. From 700 to 800 tons of flax fibre is annually worked up at this mill. In connection with this the firm do extensive business in the purchase of flax seed, amounting to $30,000 annually. Some ten years ago a Cheese Box Factory was established in the south part of the city by Simmons & Co. The farmers of the vicinity were then just beginning to turn their attention to the lucrative business of cheese making, and as the dairies increased the call for boxes was more active. A few years later, Z. G. Simmons & Co., bought out the business and removed it to the lake shore, where under judicious management, great improvements have been made in the style, quality and cheapness of the article. The company now have a large sale of their wares, and supply a great extent of country with a first quality of boxes, with every prospect of an increasing trade and remunerative profits. Kenosha is the headquarters of this young and vigorous corporation, which mainly monopolizes the telegraph business of Wisconsin, Minnesota and the western portions of the Dominion. At an early day the late Hon. Charles C. Sholes, of Kenosha, became actively interested in this new invention, which promised so much in the beginning as to nearly set the world crazy with delight and expectation, and whose goings forth has more than realized its early promise. For many years, Mr. Sholes, as agent of the Western Union, and afterwards, as one of the originators of the Northwestern, struggled to bring this invention into greater perfection and utility. No invention was ever called forth such acute and varied talents in its completion as an art, and in few has greater success vindicated the effort. It would seem but little more could be added in the way of improvements to make the Telegraph all the world can desire of it as an agent of communication. Z. G. Simmons for many years has been the moving operator of this company holding its Presidency, and H. B. Hinsdale its Secretaryship; J. H. Howe and Rouse Simmons, are on its Board of Directors. We may well claim it a Kenosha institution. The Thomas B. Jeffery Company controls one of the most extensive and important productive industries of Kenosha, being engaged in the building of motor cars, and something of the scope of the business is indicated by the fact that their employees number 2,600. The business was founded in 1900 by Thomas B. Jeffery, who was born in Plymouth, England, and when eighteen years of age became a resident of Chicago, where he was connected with the business of manufacturing telescopes. Later he was engaged in making models for the patent office and in 1879 started in the bicycle business, being one of the pioneers in that field. 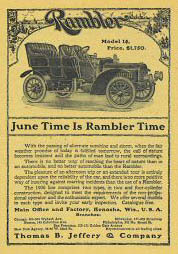 He organized the Gormully & Jeffery Manufacturing Company and began making the Rambler and other bicycles. As that business was superseded he turned his attention to the automobile business and the manufacture of motorcycles in 1897 and in 1898 built a small four-wheel auto car. The same year he sold his interest to the American Bicycle Company and in 1900 removed to Kenosha, where his interests have been developed to mammoth proportions. 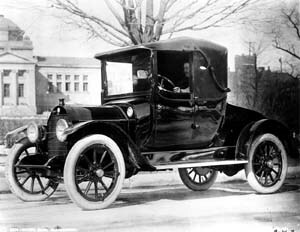 In 1902 he put his first car upon the market under the name of the Rambler, this being a single cylinder, eight horse power, machine. For the conduct of the business he purchased the Sterling bicycle plant, 600 by 100 feet, and something of the rapid growth of the enterprise is indicated in the fact that the plant today covers 101 acres. When the new buildings, which are being constructed, are completed, much more space will be added and the number of employees raised to about three thousand five hundred. The company's output is shipped to all arts of the world. The capacity of the plant is thirty-five cars and fifteen trucks daily. Since 1913 they have made the Jeffery Quad, a truck that has given complete satisfaction owing to the fact that its power of traction is delivered to all four wheels simultaneously, thus minimizing the possibility of stalling the car. It has proved so efficient both in the service of the United States army in Mexico and with the allied armies in France that it has become recognized as superior to all other makes for military purposes. The trucks have also been shipped to South America, Australia and India. Included in the equipment of the plant is a half mile cement track, which is used for trying out all cars and trucks before shipment. The factory runs twenty-four hours each day. The growth of the business has changed the west side of Kenosha from a prairie to a city, and as the employees are all well paid mechanics the class of citizens thus attracted to Kenosha are of the kind who make business. The founder of the business, Thomas B. Jeffery, passed away in Pompeii, Italy, in April, 1910, and in June of that year the business was incorporated under the name of the Thomas B. Jeffery Company, with Charles T. Jeffery as the president and general manager, H. W. Jeffery, vice president and treasurer. G. H. Eddy is now treasurer, having taken that office from the hands of H. W. Jeffery, the latter holding the position of vice president; G. W. Greiner, secretary; L. H. Bill, general manager; J. W. DeCou, factory manager; and Al Recke, sales manager. I think this is Simmons Library in the background, can anyone confirm this? The clothing establishment of Isermann Brothers at Kenosha would be a credit to any of the great metropolitan cities of the country, so tasteful is the arrangement, so comprehensive the styles and so efficient the business management. The store was established in 1892, at the corner of Main and Market streets, by M. J. and George S. Isermann, brothers, and later they were joined by others of the family. The business is today a Wisconsin corporation conducted under the name of Isermann Brothers, articles of incorporation being taken out March 16, 1915, the first officers being Michael J. Isermann, president; George S. Isermann, vice president: Anthony A. Isermann, treasurer; and Frank C. Isermann, secretary. Their location is at 214 and 216 Market Square and they occupy a building fifty by one hundred and two feet, which was completed in 1914. The second floor is used for office purposes. The building has an eighteen foot ceiling and there is a mezzanine floor all around the inside, supplying beautiful show windows. The entire store is used for men�s and boys� clothing and they carry a full line of men�s furnishings, hats and caps. On the walls between the suit cabinets and the balcony are one hundred and thirty-eight feet of cedar closets for storing furs and winter goods. The company employs ten salesmen and the establishment is one of the best equipped men�s furnishing houses of the United States. Their stock includes everything that domestic and foreign markets afford and the latest styles are always to be secured here. The business policy of the house, too, commends it to the support of the general public and from the beginning the trade has constantly grown. This company was organized in 1897 as the Windsor Spring Company, engaged in the manufacture of sanitary couches and all kinds of springs. The promoters of the original company were B. F. Windsor, Fred C. Hannahs and Frank Chesley; Mr. Windsor died in 1910. In June, 1912, the business was purchased by William W. Vincent and Vaughn L. Alward and was continued under the original name until January, 1913, when the present style of name was assumed, with Mr. Vincent as president and treasurer and Mr. Alward as vice president. Mr. Alward sold his interest in January, 1915, but Mr. Vincent still continues as president and treasurer of the company, which is a Wisconsin corporation. The plant covers an entire block east and west and nearly a block north and south. Two hundred workmen are employed in the factory and the output is sold to jobbers only.